Johnny Randle, a 74-year-old African-American resident of Milwaukee, moved to Wisconsin from Mississippi in 2011, the same year the state legislature passed a law requiring a government-issued photo ID to cast a ballot. Randle, with the help of his daughter, petitioned the DMV to issue him a free ID for voting because he could not afford to pay for his Mississippi birth certificate. Randle was forced to choose between his livelihood and his right to vote. As of the April 5 presidential primary, he is still not able to vote in Wisconsin. After voting without incident in the formerly Jim Crow South, he was disenfranchised when he moved to the North. Stories like Randle’s are why the Wisconsin Supreme Court dubbed the voter ID law a “de facto poll tax” and it was blocked in state and federal court until a panel of Republican-appointed judges reinstated the measure in 2014. Randle is one of 300,000 registered voters in Wisconsin, 9 percent of the electorate, who do not have a government-issued photo ID and could be disenfranchised by the state’s new voter-ID law, which is in effect for the first time in 2016. Wisconsin, one of the country’s most important battleground states, is one of 16 states with new voting restrictions in place since 2012. 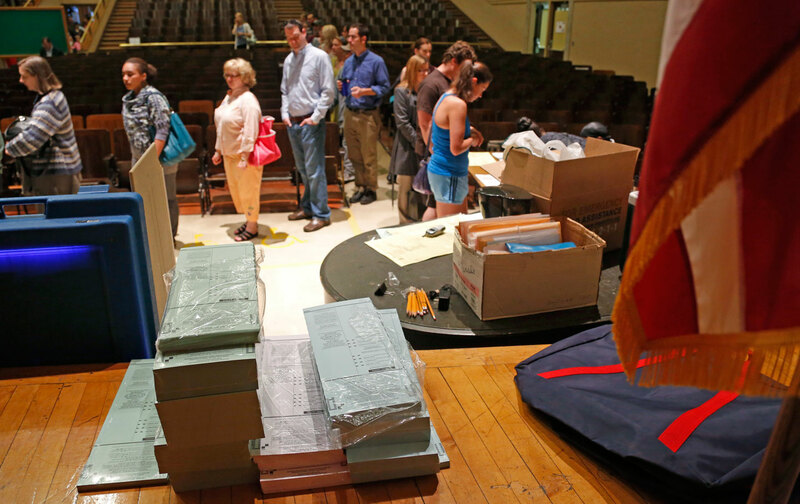 The five-hour lines in Arizona were the most recent example of America’s election problems. Wisconsin could be next. Randle’s account is hardly unique in Wisconsin. The lead plaintiff who challenged the voter-ID law, 89-year-old Ruthelle Frank, has been voting since 1948 and has served on the Village Board in her hometown of Brokaw since 1996, but cannot get a photo ID for voting because her maiden name is misspelled on her birth certificate, which would cost $200 to correct. “No one should have to pay a fee to be able to vote,” Frank said. Others blocked from the polls include a man born in a concentration camp in Germany who lost his birth certificate in a fire; a woman who lost use of her hands but could not use her daughter as power of attorney at the DMV; and a 90-year-old veteran of Iwo Jima who could not vote with his veterans ID. The law also targets students. Student IDs from most public and private universities and colleges are not accepted because they don’t contain signatures or a two-year expiration date (compared to a ten-year expiration for driver’s licenses). “The standard student ID at only three of the University of Wisconsin’s 13 four-year schools and at seven of the state’s 23 private colleges can be used as a voter photo ID,” according to Common Cause Wisconsin. That means many schools, including the University of Wisconsin-Madison, are issuing separate IDs for students to vote, an expensive and time-consuming process for students and administrators. Students who use the new IDs will also have to bring proof of enrollment from their schools, an extra burden of proof that only applies to younger voters. Right now, the dirty little open secret of Wisconsin is that just 31 of our 92 DMVs maintain normal Monday through Friday business hours. Forty-nine of them operate only two days a week. One, in Sauk City, is open for just a few days a year. Only two are open at 5 p.m., and just three are open on weekends. For the whole state. To exacerbate matters, Wisconsin has allocated no money to educate voters about the new law, as required by the legislation, and Republicans have dismantled the non-partisan Government Accountability Board in charge of supervising elections. The voter-ID law is just one of many new voting restrictions passed by Republicans in Wisconsin since 2011. 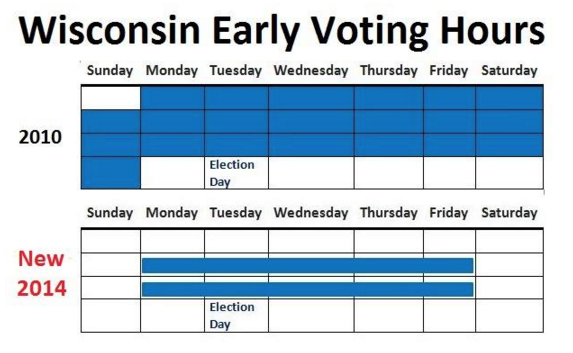 Most notably, the state legislature also eliminated early-voting hours on nights and weekends (GOP State Senator Glenn Grothman said he wanted to “nip this in the bud” before early voting in cities like Milwaukee and Madison spread to other parts of the state) and made it virtually impossible for grassroots groups to conduct voter-registration drives. Since 2011, the State of Wisconsin has twice reduced in-person absentee (“early”) voting, introduced restrictions on voter registration, changed its residency requirements, enacted a law that encourages invasive poll monitoring, eliminated straight-ticket voting on the official ballot, eliminated for most (but not all) citizens the option to obtain an absentee ballot by fax or email, and imposed a voter identification (“voter ID”) requirement. “There have been so many anti-voting laws in this state, it’s hard to keep track,” says Eicher. Wisconsin has historically run elections better than almost anywhere in the country, with consistently high voter turnout and reforms like Election Day registration in place since the 1970s. All that changed when Scott Walker and the Republican legislature took over the state in 2011.